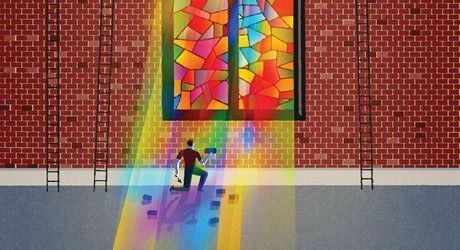 Michael Horton’s message to restless believers: Stay put, and build the church. Sometimes you can tell quite a bit about a book from its cover. On the outside, Michael Horton’s Ordinary: Sustainable Faith in a Radical, Restless World (Zondervan) looks a lot like David Platt’s bestseller Radical, and that’s no accident. Horton, editor of Modern Reformation magazine, a founding figure behind the White Horse Inn’s teaching ministry, and host of its radio show, aims to provide an alternative to trendy calls for radical living. He thinks such calls serve mainly to make ordinary Christians anxious about whether they’re really Christian enough, and pastors anxious about ensuring that their ministries are radically transformative. Horton comes to their aid with a Reformational perspective that diagnoses such anxieties as the outgrowth of works righteousness. If we are justified by faith in Christ alone, then we need not be anxious to show how Spirit-filled we are by living extraordinary, radical lives. Having already received the promise of the Spirit in baptism—God’s promise, which we can trust he will keep—we are free to serve our neighbors with ordinary good works. We are freed from establishing our credentials before God or our own consciences. And we are even free, Horton states, to enjoy our neighbors as gifts rather than making them into our own projects, as if it was our job to transform their lives.